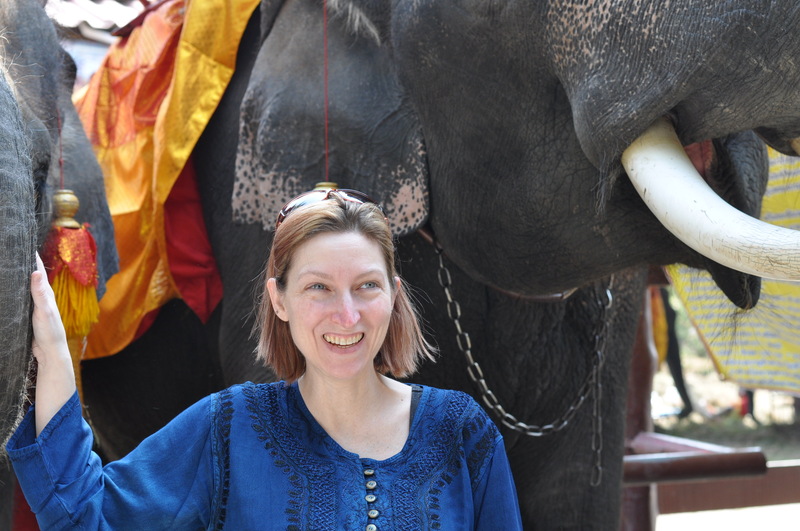 My favourite part of the trip to Ayutthaya was the elephant trek. 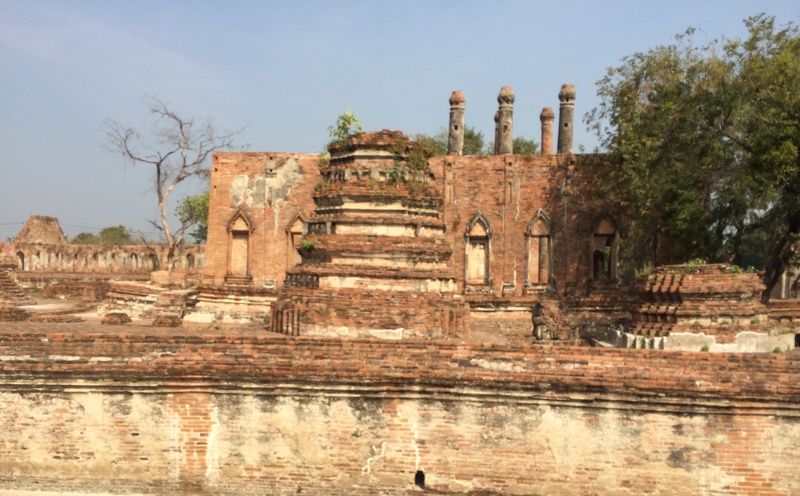 From the Pang Chang Elephant Camp, two mahouts took us out among some of Ayutthaya’s ruins, including Wat Chang (Monastery of the Elephant). This was a terrific way to see everything. At first I was concerned when I laid eyes on the sharp goading tools (Aṅkuśa) that the mahouts carried, but through the trip I realized it was used like a bridle and reins are used on a horse, to guide the animal when necessary. The tool would need to be sharp or the elephant would not feel anything through such thick skin. 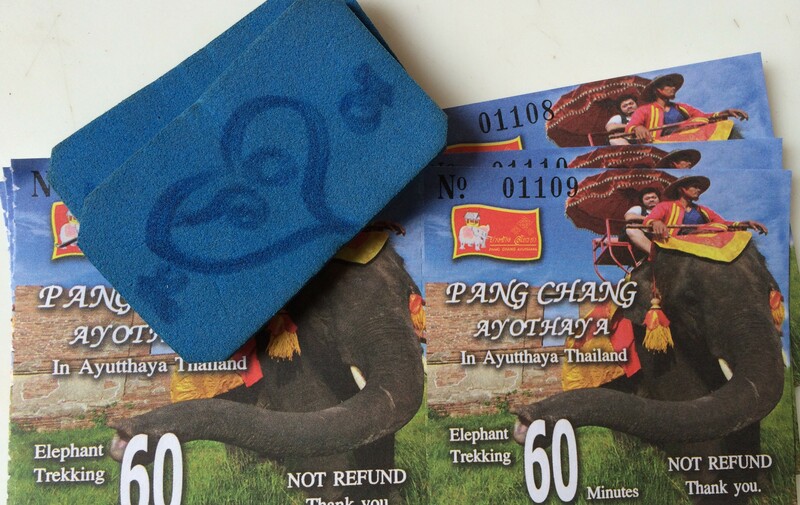 I had read some reviews of the Pang Chang establishment that mentioned mistreatment of the elephants, but I saw nothing of the kind. The mahouts were really good with their animals and the elephants seemed to enjoy the work. One of the mahouts explained that he bonded with his elephant when it was 2 years old and has been with her for 16 years. At one point, both barefooted mahouts jumped off their mounts to take photos of us with our cameras. The elephants were docile giants and you could buy fruits to feed them. I was as fascinated by the elephant’s slow plodding gait, the way they drank water at the drink station, and their attention to each other. This was a seriously cool experience on a perfect day to be outside. One of the mahouts with his goading tool. A distance shot upon approach of Wat Chang. Photo credit: Stephanie Brinkman. 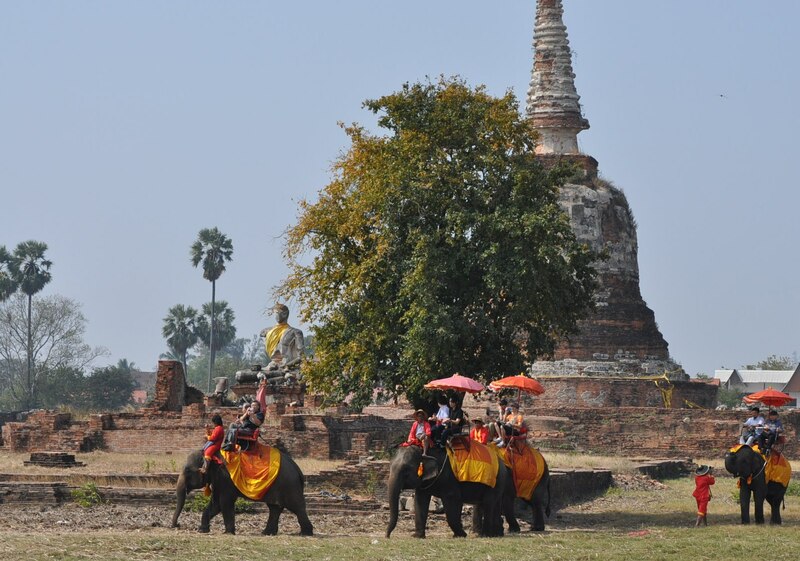 Japanese tourists rounding the bell shaped chedi of Wat Chang (Monastery of the Elephant). 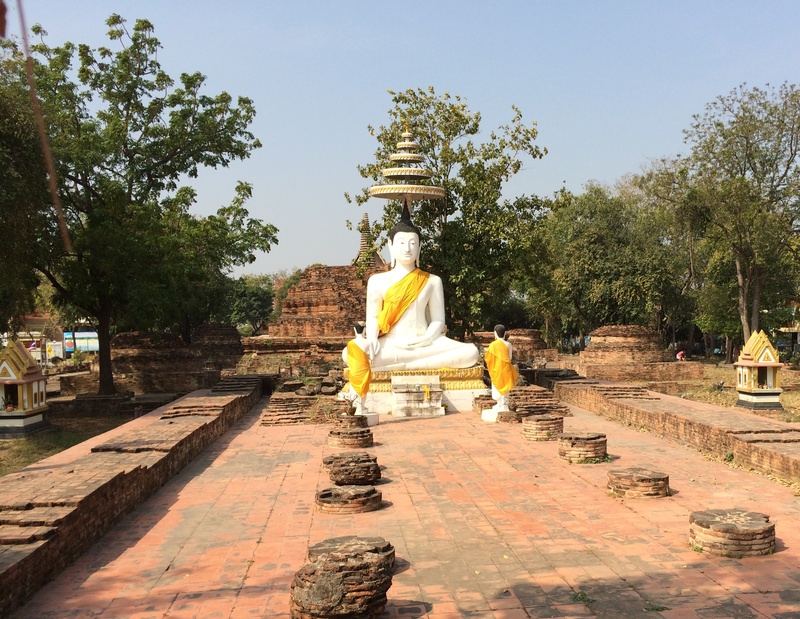 Buddha sitting below the chedi at Wat Chang. We passed this well-tended Buddha along our tour. Now this is exactly what I wanted! Traveling among ruins, though I never found the name of this site. Magnificent! 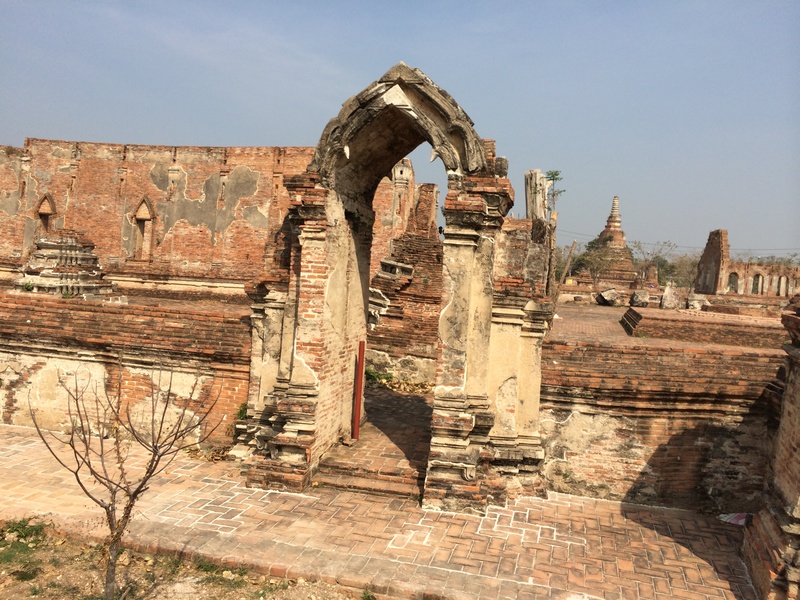 Not seen in the photos: a small group of people were recording a music video among the ruins. Such a great day! Time to give the elephants a fruit snack and say goodbye.